The K-12 Education Upgrade in the Philippines: Is it a Solution to Poverty? I’m close to completing my M.A. in Music Education. All I need to do now is write my thesis, something that’s scheduled for June of this year. In my music education seminars with one of my favorite professors, the K-12 program is discussed a lot. Matter of fact is that one of my projects for “Current Trends in Music Education” is a syllabus and sample learning plans for grade 12 music track students. It’s called “Music Production, Composition, and Sound Design with Computers”, something that I hope will be offered in schools by the time the first batch of Filipino grade 12 students start their work. I have to say first that I am all for this education upgrade in the Philippines. It’s one step that perhaps the Philippines is going somewhere towards improvement. Some people (my professor included) would even boldly claim that the K-12 program is the solution to poverty in the Philippines. Thinking about this, I would like to look into it deeper and see if it’s true. Is K-12 implementation really the solution to poverty in the Philippines? 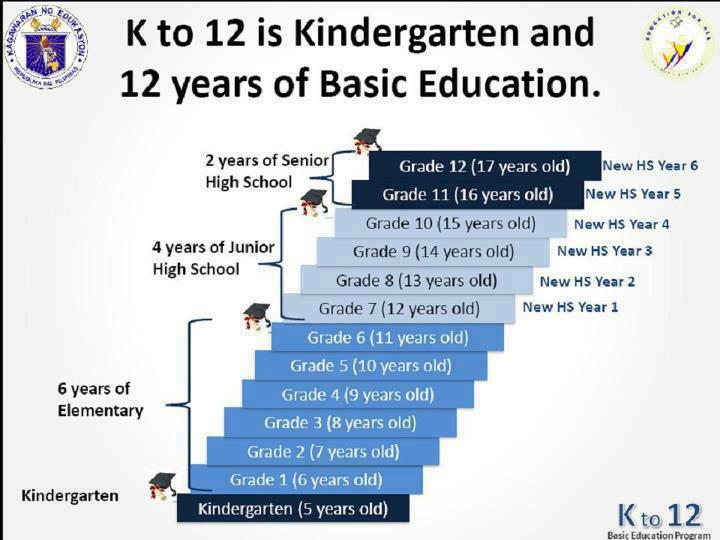 The intents and purposes of the K-12 program are good. In a nutshell, the K-12 program is designed to better prepare the students for employment and/or higher learning right after secondary school. It is assumed that the K-12 program will produce fresh high school graduates who are ready to enter the workforce immediately, allowing themselves to be contributors to society as seen in all first world nations. I see this as a very good thing, having been denied many times of employment opportunities when I was still at the college level. The K-12 program is meant to address that problem by churning out workforce-ready individuals. It is assumed that we no longer have to see job ads that require just college graduates or college-level students. Sounds good, right? On the surface, many would say yes. Reality is a different thing, however. There is some level of certainty that these future graduates of the K-12 program would have the skills and knowledge necessary for employment, but the question now is where will they get jobs? The hard reality now hits us. Many college graduates in the Philippines have it hard getting employed. I’ve experienced this myself. I was trained as an occupational therapist and I passed the boards back in August 2004. The problem was that I could not get a job at hospitals. Now, why is that? Many hospitals (yes, even commercial ones) prefer volunteers just because they don’t have to be given even a small transportation allowance. It’s a cost-cutting measure while gaining the ability to offer professional-level rehab services. Seeing that the culture in Philippine hospitals is like this, it made no sense to me at the time, especially that I already had a family to support. Volunteering simply will not enable me to pay the bills. It’s a despicable practice! A person who works has to be paid the correct wages. The premise is that rehab professionals have to slug it out for a minimum of 3 years with no salary just to gain fillers for their resumes so they can go for jobs abroad. Speaking of going abroad for employment, at this point in time it is the aspiration of many Filipinos because of the scarcity of good-paying jobs in the Philippines. Local employers only offer paltry sums for wretched, grueling hours of hard work. Let’s face it, folks. You can’t expect a call center agent earning a gross amount of Php 20,000 to provide a good standard of living for his/her family when 32% of that will go to taxes. How many years will such an employee have to spend in order to save enough to place a partial sum for a small house and lot in Cavite or Bulacan? Will such an employee be able to sustain paying off the mortgage for 10 years or more? The point is that there are only very few jobs in the Philippines that would allow for an acceptable standard of living. If such is the case of your call center agent nowadays, the situation would certainly look grim for future K-12 graduates simply because there is no assurance of them being able to get employed right after they graduate. College graduates have it hard nowadays, and it does look like it will be harder for them future K-12 graduates if things do not change. The only glimmer of hope for these K-12 as well as college grads would be to go where the grass is greener: abroad! We always hear of the government giving praises for the OFWs they barely support. OFWs are rightfully called heroes since a big chunk of the Philippine economy is due to their contributions. OFWs have to go through all sorts of crap and hell in their host countries as they try to bring home the bacon. It’s sad that many Filipinos are forced to fly away from home and be torn away from their families for employment instead of doing such things by choice. Many enlightened Filipinos have the government to blame for this. It seems to me that the K-12 program is a platform for training more OFWs for the Philippine government to send elsewhere in the world and then simply milk them dry via taxes. It’s an open secret where most of those taxes go that I don’t really have to spell it out. I do think that it is stupid to send out cows to the neighbor’s grassy plains when you have the capacity to plant some good grass yourself. Now, what do I mean by this? The Philippines can have the capacity to bring more foreign investors in to create more jobs for Filipinos if only the Government would take out protectionist economic policies as outlined in the 1987 constitution. Such policies only keep the oligarchs (who are unable to compete in an international scale) in power. Should such economic policies be lifted, highly competitive foreign investors would come in to offer better services and good-paying jobs, forcing local businesses to step up their game. It can be a win-win situation if you ask me. If such economic restrictions are lifted, we can have access to better services, technology, products, and great-paying job opportunities from both local companies (who should be forced to compete) and foreign (already competitive) businesses. Such third-world to first-world stories have been seen in the likes of Singapore and South Korea. It’s very possible for the Philippines to go such a route, which is possible only if radical changes are made in the government and in society itself! Going back to the question, is the K-12 education upgrade in the Philippines a solution to poverty? I would have to say it is not a complete solution. If these future K-12 graduates find employment as OFWs, we can say that they will be able to improve their lives and contribute to society and the economy. I would have to admit that. However, with our current presidential system of government, protectionist economic policies, rampant corruption, and the Filipino culture of having too much freedom and a lack of discipline, I would have to say that the Philippines will remain to be the sick man of Asia despite the implementation of K-12. For things to improve, us Filipinos have to start opening up our eyes and minds to the idea of change. This entry was posted in Music Education, Ramblings and Opinions, Rants, Rants and Opinions, Society and tagged education, filipino culture, K-12, K12, music education, philippines, society. Bookmark the permalink.